BARSS, JOHN, ship’s captain, businessman, politician, justice of the peace, judge, and office holder; b. 14 Sept. 1778 in Liverpool, N.S., second son of Joseph Barss and Elizabeth Crowell; m. 16 Dec. 1802 Sarah Collins, and they had one son and two daughters; d. 12 May 1851 in Liverpool. John Barss was born to one of the original families of Liverpool. His early life appears to have been spent on merchant vessels, probably those of his father, where he became proficient in the ways of the sea. He gained a body of knowledge not uncommon to Nova Scotian sea captains of his day, knowledge which would allow him secure passage on the Atlantic seaboard from Labrador to the West Indies. The various cargoes carried by Barss included all the commodities that are so often associated with Nova Scotian trade with the other North American colonies and the Lesser Antilles – dry and pickled fish, rum, sugar, staves, shingles, coffee, lumber, indigo, salt, and plaster of Paris. On 1 April 1811, during the Napoleonic Wars, his brig, the Caroline, was taken by a French brig in the West Indies. Subsequent to this loss Barss traded his master’s cabin for a merchant’s office and entered into a business partnership with his brother James. He put to work his invaluable knowledge of trading patterns along the Atlantic seaboard. With the outbreak of the War of 1812 he associated himself with James and others, including their brother-in-law Enos Collins*, as a shareholder in several privateers: the Liverpool Packet (commanded for a time by his brother Joseph*), the Sir John Sherbrooke, and the Wolverine. During the course of his mercantile career, John Barss carried on a substantial business “by himself” and also had occasion to fashion many minor partnerships in a wide variety of enterprises. As with so many other prominent merchants in Queens County, such as Simeon Perkins* and Snow Parker*, Barss combined his business activities with public service. 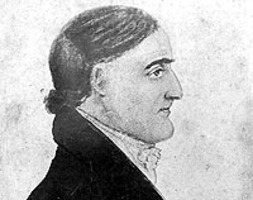 He represented Queens County in the House of Assembly from 1813 to 1820 and from 1826 to 1830. On 28 Dec. 1837 he was offered appointment to the Legislative Council but declined to accept. In addition he served the law as justice of the peace from 1819 and as a judge of the Inferior Court of Common Pleas. A prominent member of the Church of England, he was associated with the British and Foreign Bible Society and with the establishment of Trinity Church parish in 1821. He served Queens County as a school commissioner from 1826 and as a member of the board of health from 1832. It is apparent that at the time of his death Barss had acquired a fairly healthy estate. In his will he left £500 each to his wife and daughter and £400 to his granddaughter, as well as ten shares in the Bank of Nova Scotia to both his daughter and his granddaughter. His son, Edward Collins Barss, was executor of the estate and inherited the residue. His property in Liverpool was extensive and included not only several acres of town lands and appropriate buildings, but wharfs, stores, and vessels as well. Barss was not an exceptional Nova Scotian, but he was one of that hardy Bluenose breed who may be said to have been exceptional in their own communities. A man of some foresight and no small ability, he belonged to that significant class of Nova Scotians upon whom the province’s golden age secured a firm foundation. And lest he leave a patrician image, it might perhaps be useful to view the temper of the man through an entry in Simeon Perkins’s diary on 30 May 1811: “Late in the Evening a fray happened near the House of Mrs. Hopkins between Capt. John Barss and Mr. Edward Dewolf – the Latter Cryed Murder on which a considerable concourse gathered and the fray was Soon Over. I understand the Occasion was Some altercation having happened Some time ago between Mr. Dewolf and the wife of Capt. Barss and Dewolf was Suspected to have written some Defameatory piece Called an Acrostick.” It is perhaps not surprising that a man of such warm temper should have energies which would in his more mature years be put to work in business and community affairs. PANS, MG 1, 819; MG 100, 176, no.20; Places: Liverpool, Genealogies of Queen’s County families (mfm. ); RG 1, 173: 450; 174: 97, 279–80, 320, 337; 175: 85, 177, 204; 214 1/2F: 192; 245, no.113. Queens County Court of Probate (Liverpool, N.S. ), Book 2: 178 (mfm. at PANS). N.S., House of Assembly, Journal and proc., 1827: 14, 18–19, 22, 44–45, 49, 59, 62, 107, 114–16, 119, 123, 127; 1828: 193; 1829: 375, 383, 417, 452, 557; 1830: 601, 608–9, 618–19, 628, 630, 679, 691. Simeon Perkins, The diary of Simeon Perkins, 1797–1803, 1804–1812, ed. C. B. Fergusson (Toronto, 1967; 1978). Directory of N.S. MLAs. J. F. More, The history of Queens County, N.S. (Halifax, 1873; repr., Belleville, Ont., 1972). G. E. E. Nichols, “Notes on Nova Scotian privateers,” N.S. Hist. Soc., Coll., 13 (1908): 111–52. John G. Leefe, “BARSS, JOHN,” in Dictionary of Canadian Biography, vol. 8, University of Toronto/Université Laval, 2003–, accessed April 24, 2019, http://www.biographi.ca/en/bio/barss_john_8E.html.